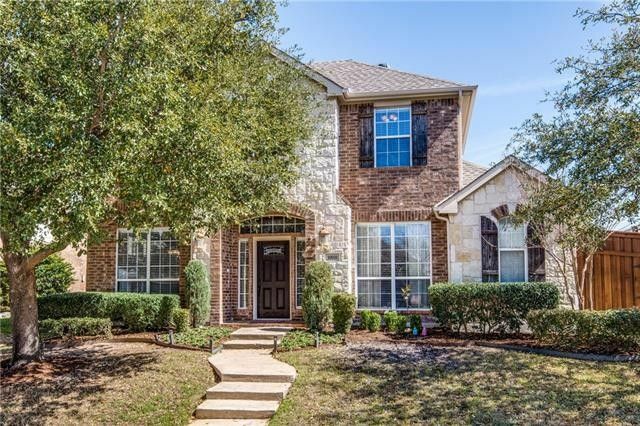 Great Drive up on Beautiful home in The Trails of West Frisco! This home has space for everything-Family, Home Office and Entertaining-inside and outside. Study and Formal Dining room are welcoming at Entry. Kitchen has huge island, open eating area and butlers pantry. Two story ceiling in main living area with fireplace that opens into extended Cedar covered stamped concrete patio with outdoor fireplace and entertaining area. Backyard is landscaped with board on board fence and play set. Upstairs are 3 bedrooms, large game room (over garage) and cute reading nook or homework space. Master bedroom is split for privacy and has large in suite bath and 2 walk in closets. Community has pool and park. Don't miss it! Directions: Dallas North Tollway to Main Street, West on Main, North on Teel Pkwy, West on The Trails Pkwy, South on Sonnet, West on Cedar Wood, South on Slick Rock Trail. House is on left.